Hi everyone, how are you all? I hope everybody's had a great Halloween weekend. I really enjoyed all the Halloween manis I've come acrossed in the last couple of weeks, some were cute, some were scary and many were very funny :) I wish I could've shared some Halloween nail art with you myself, it's such a fun theme! But unfortunately the last few weeks have been the busiest so far this year. So no Halloween parties, but on top of that I also had to skip my birthday which was on the 30th. I'm 22 now! It's not that bad though, my party's just postponed ;) Anyhow, I'm rambling, let's talk nails! This is OPI Dating A Royal with a layer of Essence Make It Golden that I added the day after, and a coat of Essence Matt Topcat. 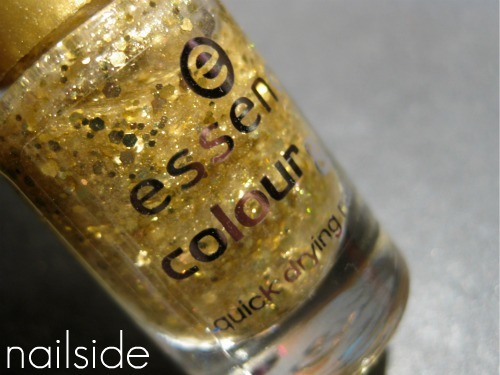 Make It Golden is a glitter polish with tiny, tiny, golden microglitter and larger, multi-sized hexagons. I own quite a few golden glitter polishes but Make It Golden is actually something unique in my collection. The hexagons spread okay and the microglitters are pretty dense, but they don't completely cover the base color, which I'm pleased with. Another plus is the price, this golden beauty is only €1.29 for 0.16fl.oz/5ml. Not bad! 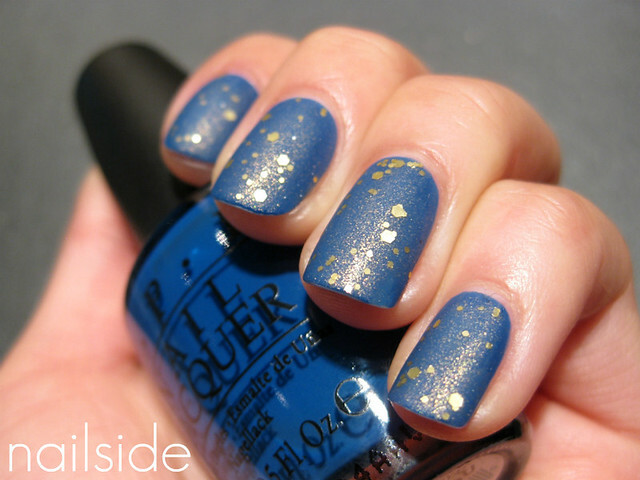 Oh my, the blue color from OPI is aamazing! That is amazing. I love the gold glitter. I've tried something similar but my gold just isn't that great. Happy late Birthday!! :) cute nails! Happy Birthday, Jane! Great combo. I haven't tried my Make it Golden polish yet... Now I really want to give it a try. Congrats on turning 22 :)! And I like this combo, very pretty. Happy belated birthday :) Love this combo, matte glitters always look great. Great combo, and I really like it matte! Love it with the gold flake - wonder if Nubar 2010 would look about the same or if it would turn to green flake like it does on some base shades? We are born a day apart - and light years apart...I am a Halloween baby - the 31st. Happy belated b'day to both of us!!! This matte and We Always Will Have Paris grew on me - but I admit now I usually put clear top over them to bring out all the amazing shades that are hidden from view in them each left matte. This looks so cool! I just commented on your post on OPI Dating a Royal but now I have to get that glitter polish. I have a matte top coat and have to say that I'm surprised how amazing it looks on most shades, now I'm definitely going to try it over glitter too.